Impassioned students attended yesterday’s Student Union Assembly’s (SUA) Chancellor Search Student Town Hall to voice opinions about the replacement of current UC Santa Cruz Chancellor George Blumenthal. 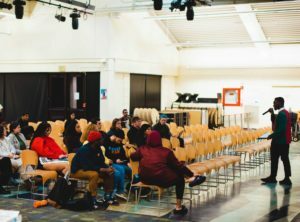 The Wednesday town hall, which hoped to include student input in the chancellor selection process, drew about 25 students. The event provided limited answers regarding committee nominees and examined potential obstacles in the nomination process. Several students raised the need for a chancellor who focuses on existing students instead of potential ones. “This school does so much to get us here, but they do nothing to keep us here. I really want the next chancellor to care about retention,” said first-year transfer student De Anna Pittman. Other students expressed desires for a chancellor who actively supports student needs for safety and funding. In particular, some students were concerned about protecting undocumented students and meeting the needs of students of color and other historically marginalized groups. Graduate Student Association President Randy Villegas said he wants a chancellor who advocates for all students, including the graduate body. Transparency around the interviewing process remained unsolved by the end of the meeting. Following regents’ protocol, information regarding the candidates must remain confidential throughout the process. At the moment, Banjo does not plan to hold another town hall, but said due to the low turnout, the committee will look for new ways to engage students in the near future. The advisory committee will recommend candidate finalists to UC President Janet Napolitano some time between March and May.